The Campus Planning and Development Office wishes to thank everyone who took part in the various community engagement activities for the University Master Plan which took place from January 16th through February 15th 2019. The feedback received as part of this exercise has informed the Master Plan and its next round of stakeholder engagement.. We will keep you posted as the Master Plan work progresses. Effective stakeholder engagement is critical to ensure the success of planning initiatives. The Campus Planning and Development Office (CPDO) is committed to engaging with stakeholders throughout the planning processes that we lead. By actively soliciting input from internal and external stakeholders and communities, we are able to meaningfully enhance the campus. In continuity with past efforts, the overarching purpose of our community outreach initiatives is to initiate and/or deepen a dialogue with key stakeholders. This will promote a shared understanding of a common vision and enable the integration of community feedback. Inform and raise awareness about campus planning exercises and the objectives they seek to address. Build capacity among stakeholders to participate in ongoing engagement dialogues. Obtain broad and diverse input on different aspects of campus planning. Provide platforms for the community to ask questions and seek clarification. A climate of inclusion and transparency. An appreciation of how community needs are reflected in planning initiatives. A strengthened understanding of the objectives that the Master Plan and other planning initiatives seek to achieve. A sense of continuity with past community engagement processes. From January 16th to February 15th 2019, a series of activities and feedback platforms were offered to the McGill Community to give feedback concerning the University Master Plan and key initiatives. 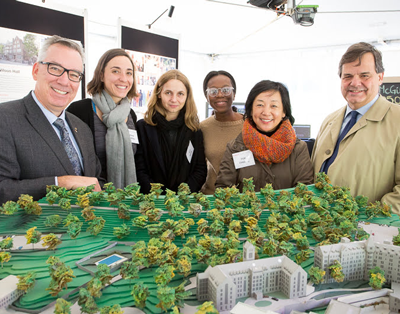 This was also an opportunity for the McGill community to learn more about the vision underlying the Master Plan and directly exchange with members of the campus planning team. Comments and feedback received will inform the Master Plan as well as the next round of community engagement. From Friday, February 1st to Tuesday, February 5th 2019, the McGill community had the opportunity to view a Master Plan display at different venues across the University including Macdonald Campus. Members of the Planning team were on-site to answer questions and hear comments. See below for the display panels. Watch the presentation on the Master Plan made during the community briefing. From January 16th to February 6th, an online questionnaire was made available for the McGill community members to share their thoughts about our campus spaces. We thank everyone who took time to respond!